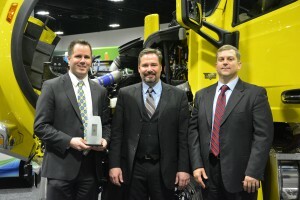 PACCAR was honored with this year’s Eye on Biodiesel “Initiative Award” for their commitment to #biodiesel blends. Giving remarks during the Biodiesel Showcase, Jason Johnson, director of aftermarket for PACCAR, announced that the new PACCAR MX-11 engine and all model years of its MX-13 engine, both legacy models and new equipment, are now approved for use with B20. More than 100,000 trucks, both new and old, join the biodiesel ranks and each year and these vehicles drive more than 12 billion miles. With this announcement, Johnson said there are now nearly 1 million Peterbilt and Kenworth medium and heavy duty trucks approved for use up to #B20 biodiesel blends. “Increasing our support level from B5 to B20 biodiesel blends provides more choice and value to PACCAR’s customers,” Sproull added. To learn more about PACCAR’s commitment to biodiesel and to learn more about the “bright yellow truck,” watch my video with Jason Johnson.